Uncle Bill's Pet Centers. Cobalt Coral Food Powder - .7 oz. 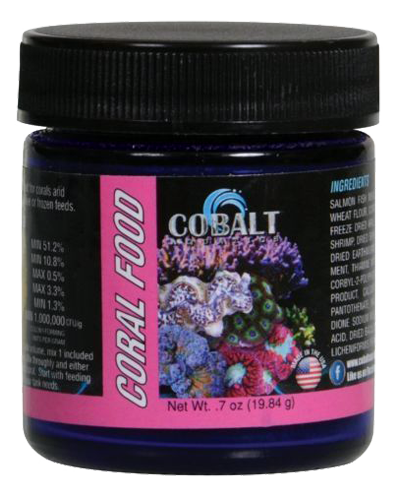 Cobalt Coral Food Powder - .7 oz. At Uncle Bill’s Pet Center, we not only offer Cobalt coral food for sale, we also employ a highly trained staff that can assist you in finding an appropriate formula. A fine powder, fully nutritious food for all corals and other filter feeding invertebrates. Formulated with a full array of squid, salmon, krill, plankton, mussel, oyster and brine shrimp proteins, coupled with fish oil and spirulina algae. This broad spectrum, highly attractive formula will get the corals attention and incite a vigorous feeding response, and stimulate incredible growth and color in your inverts. We will be glad to work with you to ensure that you feed your coral quality food for optimal health and happiness by providing the best selection and value on premium aquarium food for sale in Indiana.